Regulatory networks are directed networks of genes and regulatory proteins called transcription factors. 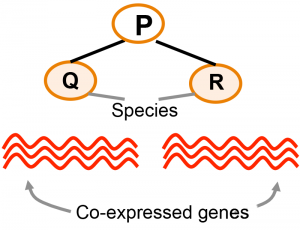 The transcription factors are the “controllers” of gene expression of a gene specifying when and where a gene is expressed. There are two parts to a regulatory network: the structure, specifying which transcription factors regulate which genes, and the function, specifying the logic and control of how the expression level of transcription factors determine the expression of downstream genes. Inference of a regulatory network requires that we solve both problems, i.e. find what the edges are and find what mathematical functions precisely capture the relationship between transcription factors and output gene expression. Expression modules are sets of genes that have similar expression profiles under a given condition, often because the genes are regulated by the same set of regulatory factors. While identifying such modules in a single species is a well-understood problem, doing so across multiple species is still in its infancy. However, this is important, because changes in gene expression are likely to play a major role in the evolution of complex behavior of organisms. We are interested in developing algorithms to identify such modules across species. Identification of evolutionary principles involved in shaping and constraining regulatory and protein interaction networks. This entails learning networks across multiple species. Learning causal networks describing tissue and disease-specificity.Learning high-resolution networks, that is networks where edges represent physical interactions, rather than functional interactions among nodes. Such networks include entities of many different types, some of which we cannot directly (protein and metabolite expression) requiring hidden variable inference algorithms. Learning networks of condition-specific responses, where a condition represents a global variable for a biological system (cell, tissue, organism) and affects the behavior of the system as a whole.